A few weeks ago three friends and I strapped on snowshoes for a half mile hike to the Solitude Yurt for dinner. Working in the ski industry I spend a good amount of time at ski resorts, but never at night walking up through the trees to get to a yurt. Joe, our chef and Ann, our guide and chef&apos;s helper, did everything in their power to make sure it was a first-class evening. 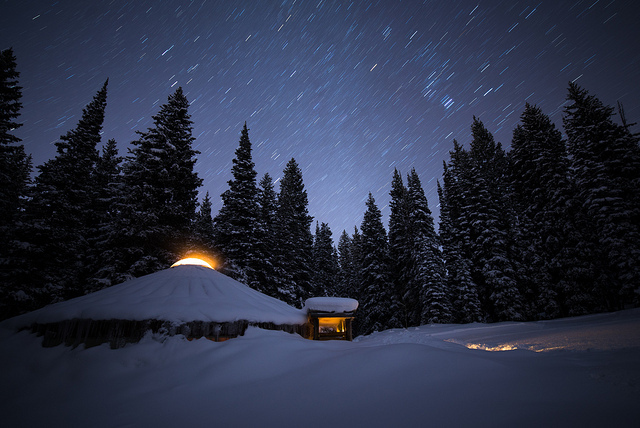 According to Wikipedia, yurts are "traditionally used by nomads in the steppes of Central Asia," have stoves in the middle and a door that faces south. According to Ann, our yurt was built by ski bums. Although yurts have been around for 3,000 years, this was my first experience in one and upon entering I was immediately filled with a sense of comfort. Perhaps because I didn&apos;t fall on the way up like several in our party did and arrived fairly dry, but probably more because I knew there was good food and good wine in store. And I was right.